In many quarters, pizza has been described as the perfect food, a blend of delicious ingredients sprinkled on some dough, baked together with sauce and cheese. It is, quite simply, delicious. Which is why it is the perfect complement for wine, nature’s perfect drink. Fresh, juicy grapes crushed, fermented and aged, flavours and characteristics reflecting the soils and climate of the vineyard of origin and the barrel in which it rested. Wines offer varied tastes and experiences with each sip, not unlike the different flavours you can get with each bite of a pizza. 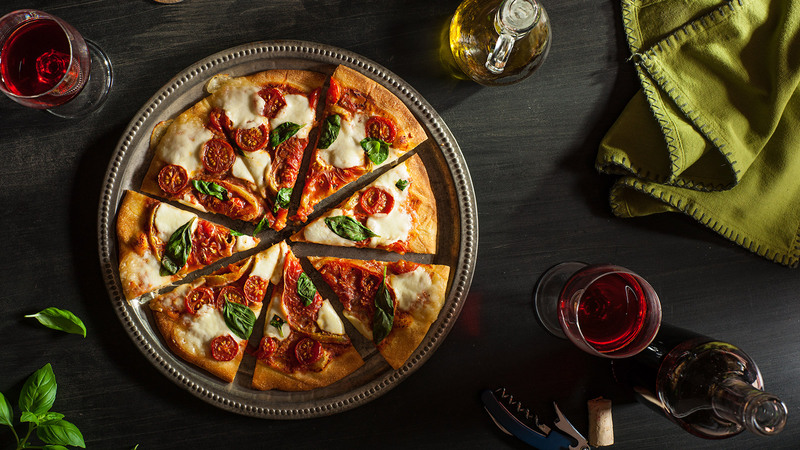 The combinations of pizza toppings are near endless, but Fiona offers the following wine pairings for some classic pizzas. Cheese — Wine and cheese on their own pair exceptionally well, so why wouldn’t that be the case when the cheese is all melted and gooey? Try opening a bottle of Cabernet Merlot — it will bring out the fresh tomato notes in the pizza sauce, and Cabernet pairs well with any cheese. Pepperoni — The smoky spice of the pepperoni dotting the pizza calls for a nice blend that includes some equally smoky notes of Baco Noir. Add some Gamay Noir and Merlot — as found in the FRESH Perspectives Satin Red blend — and it brings it all together with the cheese and the sauce. Veggie — The options for veggie toppings are near endless, but among the most popular are veggies and onions. These tangy flavours are nicely complemented with the bright citrus notes found in a Pinot Grigio. Pineapple — Put aside the raging and unsettled argument about whether pineapple belongs on a pizza. For those who enjoy it, the pineapple notes to be found in Sparkling Riesling would really make that lavour pop on the pizza! And who wouldn’t enjoy bubbles and pizza?